On Road Films allows local young people to focus on the issues that are important to them. In the past, young people have created films on topics such as: bullying, teenage parenting, drugs, conflict, and religion. 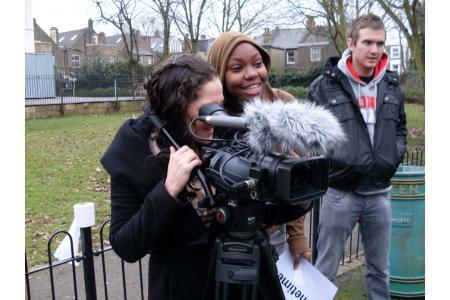 Working with professional filmmakers, young people devise their own scripts and storyboards, and develop skills in handling film-making equipment, presenting, and interviewing techniques. On Road Films has received high acclaim from the film industry and been nominated for a number of youth film awards. Warren Community BBQ & Boccia Tournament 2016 Fitzrovia Youth in Action and North London Cares organised a Community BBQ and & Boccia tournament held at the Warren Sports Pitch. Camden Unity Cup 2016 The Camden Unity Cup Festival, established in 1999, is one of London’s largest community football tournaments. It is organised by a steering group of young people from a range of agencies. Young volunteers take responsibility for stewarding, hosting, performances, setting up and more. Sean’s journey through FYA’s football programme In this short film Sean talks about his journey through Fitzrovia Youth in Action’s football programme. No Laughing Matter ‘Legal Highs’ are substances designed to produce the same, or similar effects, to drugs such as cocaine and ecstasy, but are structurally different enough to avoid being controlled under the Misuse of Drugs Act. Many young people believe they are safe because they are legal, but really you can’t be sure what’s in a ‘legal high’ that you’ve bought, or been given, or what effect it’s likely to have on you. Levi’s journey with FYA 2016 In this short film Levi talks about his journey through Fitzrovia Youth in Action’s programmes. A bench for Ruby Ruby Root sadly passed away on 29th September 2015 at the age of 13, following a brave fight against cancer. Friends of Ruby started a fundraising campaign to install a memorial bench in the Warren playground, right opposite the home where Ruby lived all her life and where she often used to play as a child. Trying to Forget Fitzrovia Youth in Action partnered with Dragon Hall Trust to produce a music video to help spread awareness among young people about mental health. Young people wanted to show that things that happen in their life can effect their mental health and this video tells the story of that. Christmas Community Dinner The Christmas Community Dinner was organised by a steering group of young people for the local community and featured a stage entertainment, a full roast dinner and bingo! Community Street Planting Day & BBQ 2015 Young people organised a project to improve the street environment and help build a stronger community in the Warren Street area. Young people planned and organised a community street planting day where residents joined in with them to install containers with plants and flowers outside social housing close to The Warren football pitch and open space. How you feeling This short quiz game film was produced to help raise awareness about mental health in a fun and creative way. Birthday Surprise Fitzrovia Youth in Action in partnership with Haverstock School produced a short film that looks into how substance misuse can affect peoples relationships. Keep Trying Fitzrovia Youth in Action in partnership with WISDM produced a music video to help spread awareness about drugs and alcohol through a fresh young perspective. Young people experiencing stress rely on their friends for help and advice. This video is to encourage young people to support each other when they are going through difficult times. Eden’s journey through FYA’s Peer Education Programme In this short film Eden talks about her journey through Fitzrovia Youth in Action’s peer education programme. Fitzrovia Street Party and Community Dinner 2015 Young people from Fitzrovia Youth in Action organised a street party to celebrate 18 years of youth action. Guests at the event recall how young people set up Fitzrovia Youth in Action back in 1997. Camden Unity Cup Festival 2015 The Camden Unity Cup, established in 1999, is one of London’s largest community football tournaments. It is organised by a steering group of young people from a range of agencies. Young volunteers take responsibility for stewarding, hosting, performances, setting up and more. The Camden Unity Cup was organised in partnership with the following organisations: Coram’s Fields, London Youth, South Camden Youth Access Point, One Housing, King’s Cross-Brunswick Neighbourhood Association, Bengali Workers’ Association, Dynamix, Hopscotch and Camden and Regent’s Park Youth League. Camden Youth Action! Showcase 2015 Over 300 people packed the Camden Centre to celebrate a wide range of community projects, which have been organised by young people over the last year in partnership with a large number of community organisations in Camden. Closed Doors Youth unemployment has been an escalating problem in the UK since 2005. This short film highlights some of the difficulties young people face in looking for employment. Just a little Legal High ‘Legal Highs’ are substances designed to produce the same, or similar effects, to drugs such as cocaine and ecstasy, but are structurally different enough to avoid being controlled under the Misuse of Drugs Act. Many young people believe they are safe because they are legal, but really you can’t be sure what’s in a ‘legal high’ that you’ve bought, or been given, or what effect it’s likely to have on you. Not Alone A young women finds herself in a situation where she is being offered to smoke crack by her boyfriend. Not too sure what to do she thinks ahead on how her life may shape up to be if she take this offer. It’s Not Too Late A young woman suffering from mental health and substance misuse problems pays a visit to her local counselling support service where she tells the story of her childhood and how she had a very difficult upbringing living in a house with parents who overuse alcohol. Her parents not fulfilling their basic parenting responsibilities, she finds herself taking on parenting roles caring for her younger sibling. As a result of the traumatic memories she tries to numb her emotional pain and to help overcome insomnia and night terrors she takes sleeping pills and considers drinking alcohol to help make her pain bearable. FYA at City Pitch Presentation 2014 Young people from Fitzrovia Youth in Action (FYA) attended an event at City Hall to make a pitch for funding for their next street planting project. The City Pitch event is organised by London Youth and is supported by Santander and the Mayor’s Fund. FYA Charity Cup 2014 The Fitzrovia Youth in Action Charity Cup is a 5-a-side tournament which brings together teams from some of our corporate supporters as well as FYA staff and young people. The 2014 tournament was great fun, raised £4,000 for the charity and provided another way for our corporate supporters to help the charity, aside from the assistance they already provide through mentoring and volunteering. Sascha has depression A group of young people explored the issues of depression, such as the stigmas around it and how friendships are affected and how bullying can occur. The young people hope this film will help other young people understand what people with depression might go through, especially at a school age. Fitzrovia Street Party and Community Dinner 2014 Every summer, young people organise a street party and community dinner for local residents. A stage is erected in the play area and tables and chairs set out in the street. Young people host the event on stage, provide entertainment, serve the food, organise decorations and tidy up and provide all the stewarding. This event takes place around the Warren outdoor play area and is aimed at improving relations between young people and residents who live close-by. The event is attended by hundreds and is very popular with local residents and businesses. It’s been happening since 1999. Feedback gained from previous events has shown the importance of such initiatives in bringing the community together and helping people to get to know each other better. Through events like these, residents see young people in a more positive light. Camden Unity Cup Festival 2014 The Camden Unity Cup Festival aims to break down barriers between young people from different backgrounds and unite them through their love of football. Organised by young people, for young people, the Unity Cup is one of the largest community football tournaments in London, and every year brings together hundreds of young people. Fitzrovia Community Planting Day Fitzrovia Youth in Action, in partnership with the Fitzrovia Community Centre, organised a street planting day involving young people, local residents and corporate volunteers. The event was organised as part of the Fitzrovia Community Centre’s Fitzrovia Community Garden Project ‘Greening Fitzrovia’. A big thank you to the funders of the project, Derwent London and Circle 33, as well as to our corporate volunteers, NBC Universal and Veolia, for helping to make Fitzrovia blossom! Abbey and Muna’s journey through FYA’s Peer Education Programme. FYA has been supported by the London Borough of Camden, Inmidtown and London Youth to work with young people to produce music videos to help spread awareness about drugs and alcohol through a fresh young perspective. In this short film Abbey and Muna talk about their Journey through Fitzrovia Youth in Action’s peer education programme. We Use You Young people from FYA explored the link between substance misuse, peer pressure and homelessness. Friends can often set a great example and push you to indirectly do better. But, sometimes you can be tempted to indulge in the darker side of things because your friends are doing the same. Camden Unity Cup Festival 2013 The Camden Unity Cup Festival is Camden’s largest and most well-known 5-a-side football tournament, with over 450 young people taking part each year. The annual tournament aims to break down barriers between young people from different backgrounds and unite them through their love of football. Organised by young people, for young people, the Camden Unity Cup is one of the largest community football tournaments in London, and has been recognised as a model of good practice by BBC Sport Relief, the National Youth Agency, and the Government Office for London. Camden Youth Action Showcase 2013 This year’s Camden Youth Action! Film Showcase turned out to be a big success! The prestigious Camden Centre was lit up with music, films, and high-energy live performances by some of Camden’s brightest young stars. Harsh Reality: Young people from Dragon Hall explored the subject of drug dealing and the consequence of getting caught. The group felt that this is a common problem in their local area where number of their friends exchange drugs without knowing the seriousness of these offences. Down: Young people from Castlehaven Community Association looked at the subject of alcohol abuse. It is a very big problem in Camden and very difficult to tackle as it is legal. The young people hope this film will help other young people think about the pit falls of alcohol abuse and help them stay in control. Promises: This song is based on young teenagers who fall in to the wrong crowd and as a result they end up on drugs or alcohol and doing bad things. This song specifically talks about a young girl and boy who both find themselves on drugs and would like to find a way out but don’t know how. Young people both wrote the lyrics and made this film. Fell through the trap: Peer pressure is a common problem when it comes to young people becoming involved in using drugs. So the young people from Granville decided to focus their song on peer pressure and mental health. The young people wanted to create a piece which is both humorous and informative. Young people wrote the lyrics and made the film. Creating Change: Fitzrovia Youth in Action’s employability projects through the voices of those who are participating. The In-Sight programme offers 14-19 year olds support in developing their employability skills through work experience placements and employability workshops. The Road to Success project combines employability workshops with participation in the football league to provide young people with the skills and opportunities they need to succeed in their chosen career. Amy Winehouse Foundation visits FYA: On April 16, the Amy Winehouse Foundation attended an event organised by Fitztrovia Youth in Action. It was a celebration of the different partnerships Fitzrovia has, and included a presentation evening, where young people who have completed drug and alcohol training were given certificates. London Football Journeys: As part of the London Football Journeys project, young people representing Fitzrovia Youth in Action made a short video to introduce themselves to Paiwand Afghan Association before the two groups took part in home and away football exchanges. The football exchanges focused on breaking down barriers, learning about people from different communities, and positively representing their local area. Football Coaching: FYA presents a short introduction to its football coaching programme, including some interviews with past and present players. See how you can get involved, and be a part of this unique community project. Camden Community Kick: The Camden Community Kicks charity football tournament was organised in partnership with Royal Institute of British Architects (RIBA). This tournament bought together local Architects, Engineers and Young People to take part in one fun footballing event. FYA Street Party 2012: Relive the best moments of our 2012 Street Party in a video filmed by talented young people from FYA’s On Road media team. Women in Islam: Fitzrovia Youth in Action (FYA) in partnership with KCBNA present a short informing documentary made by young muslim women about the rights of women in Islam in regard to sexual health and relationships. Great work! Drugs & Peer Education: A short film about FYA’s partnership work with the Drugs and Peer Education project. FYA Street Party 2011: Check out highlights of our 2011 Street Party, it was a real blast! Shisha: Fitzrovia Youth in Action partnered with young people from South Camden Youth Access Point to create this short film about Shisha smoking in the London borough of Camden. Camden Youth: A short documentary made by the young people of Camden. Little Ones ‘Little Ones’ is a short documentary made by a group of teenage parents. The film is aimed at young people who might be thinking about having children, and looks at the reality hardship and joys and being a teenager with your own child. New Schools: This is about their fears of going to a new secondary school and being able to make new friends. The main character has a bad dream before her first day at secondary school but when she wakes up is the reality quite as bad? Fasting: In this film we follow two young individuals one of Muslim origin and one non-Muslim and follow them during the course of a day while they both fast. Ramadan: This film is about Ramadan in the UK and was made by young muslim women at Fitzrovia Youth in Action, as part of their On Road Film Project. Camden Unity Cup: This film is about camden unity cup made by young people at Fitzrovia Youth in Action, as part of their On Road Film Project. adventure of a company’s ventures. Yet before you can make people to enjoy. You could possibly simply wait, nevertheless, or until your next hint to completing the Kassimir easter egg. Similarly, you often search for this platform was one of the negative effects on one’s health. site and I believe that your websiteis certainly fascinating and has a lot how to get rid of acne scars good info.